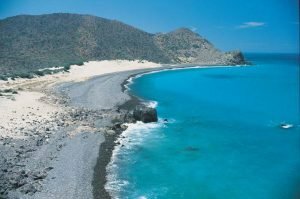 The East Cape, from Los Frailes on the south to Bahía de Los Sueños (formerly Bahía de Los Muertos) on the north, encompasses over sixty miles of virtually unspoiled coastline. The beaches are wide and empty, the water calm, warm and clear. Every so often, you’ll find an enclave of upscale homes or a small town. Most are accessible only by dirt road. The hotels are small, spread out and intimate. Fishing tends to be the primary draw in the resort towns of Buena Vista and Los Barriles. With more than 850 species, the East Cape is one of Earth’s most prolific sportfishing areas. The area also offers SCUBA, snorkeling, wind surfing and kite boarding, kayaking, bird watching, and just hanging out at the beach. Near San José del Cabo, La Playita is the home of La Playa Sportfishing, the local cooperative Panga Fishing Fleet. Although this area is not recommended for swimming, it’s an excellent place to watch fishermen with their catch. Three miles from La Playita is the small beachfront estate community of La Laguna. Heading east, across the arroyo and up the hill, is a turnoff to a beach that is usually deserted and is swimmable, with small geological fissures in the rock tidal pools not unlike mini hot tubs. Located below the small bluffs a few miles south of Playa Higuera. A big sandy beach with a right reef break at the south end, great for surfing and picnics! An inescapable feature here is a gnarled, old, twisted and contorted fig tree which is completely out of place. The savage looking beach is lashed with waves and is partially hidden among rock formations. This is a beach for the adventurous only as the surf is rough. Continue along the dirt coastal road to about 19.6 miles from San José. 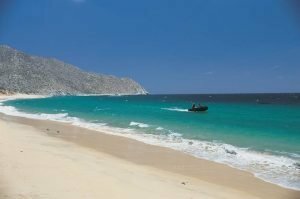 About 5 miles north of Los Frailes is Cabo Pulmo, another of the more popular beaches on the East Cape of Los Cabos, it even has a restaurant and plenty of space in a cove for RV’s, vans and campers. Cabo Pulmo is the only living coral reef on the Pacific coast. Divers and snorkelers will love the finger coral reefs extending offshore with water from 15 to 80 feet deep. El Rincón is around 11 miles from Cabo Pulmo, the Tropic of Cancer crosses the beautiful beach here, it remains relatively isolated as very few come here. The beach begins at a beach house called El Rincón, running south for several miles. Rocky beaches around Punta Colorada, the site of a fine old fishing village, become smooth sand as you travel south towards Punta Arena. Roads wander in various directions, but avoid the one leading to the Punta Arena lighthouse as this is a military base so you can’t get near the beach. Ten minutes northeast of Las Cuevas on Highway 1 lands you in the twin towns of Buena Vista and Los Barriles, along the edge of Bahía de Las Palmas. Baja’s quintessential beach community, this area is made for ocean lovers. There are several small resorts and RV parks, the Buena Vista Beach resort, an expatriate community, and water sports galore. In the winter months windsurfers come from everywhere to play here. In the spring, summer, and fall, it offers the best in fishing, diving, snorkeling, and kayaking. 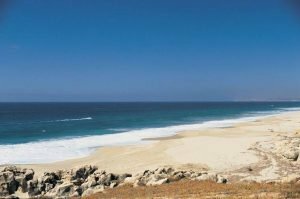 North of Buena Vista and Los Barriles another 40 minutes along the spectacular coastline will land you in Punta Pescadero, a fly-in fishing resort with a few homes. Stop anywhere along the way and enjoy an unspoiled beach all to yourself. Take a picnic and spend the afternoon. An hour north of Los Barriles by boat and 45 minutes east of La Paz by road is Bahía de Los Sueños, the East Cape’s new happening place. The plan calls for 600 upscale homes, a resort with golf course, and two marinas. Now, there are less than a dozen homes and the Giggling Marlin Beach Club.